The Keepsake Collection From MCS Supply Inc.
Handcrafted from exquisite maple wood. 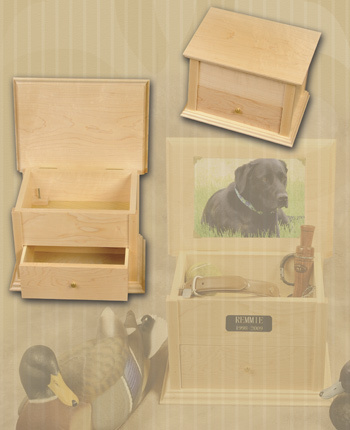 The Keepsake Collection urn offers a lockable drawer for safe keeping of your companion's ashes. The hinged top opens allowing a photo to be displayed, along with a compartment to keep those special items such as a collar or a favorite toy. SMALL 9 ½" x 6 ¾" x 6 ½" 77 Cubic"
LARGE 12" x 8" x 8½" 159 Cubic"